The June 6, 1944 Allied landings in France were an overwhelming success. With more men and materiel landing each day, the growing power of the American and British forces should have resulted in a drive inland — but three weeks after the landings, the shallow beachhead had only expanded slightly. There was growing concern that the bloody fighting of the First World War might be repeated. British forces should have captured the city of Caen, just 15 kilometers from Gold Beach, on the first or second day of the invasion. British Field Marshal Bernard Montgomery, commanding 21st Army Group, faced great pressure to secure the city and tie down German mobile forces while the Americans captured the port of Cherbourg. But a direct attack on the city itself failed at the cost of many Canadian and British lives. Next the British attacked west of Caen, where a successful advance might outflank the city and force a German retreat: Operation EPSOM, an attempt to gain by maneuver what could not be taken by assault. British divisions, fresh to war but having trained for years, faced the feared SS troopers of four panzer divisions. Both would soon learn the harsh realities of war in the hedgerows and fields of Normandy. Although Montgomery in the end did not force the Germans to abandon Caen itself, he did draw the German armor onto the British Army, who both tied it up and ground it down. The whole purpose of sending I and II SS Panzer Corps to Normandy was to drive the Allies into the sea. Steady British efforts forced the commitment of the armored formations as they arrived on the field and so depleted them that no coordinated German offensive was ever launched. 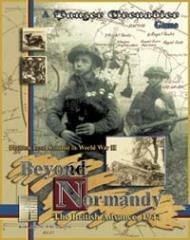 Beyond Normandy is a Panzer Grenadier game covering the British operations from the end of June to the middle of July and the German reactions to them. Three maps (two 22" x 34" and one 22" x 17") depict the actual battlefield at 200 meters a hex and include individual bridges, villages, tracks, roads, hedgerows and church steeples. 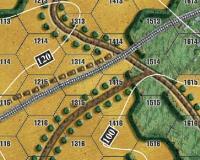 The 583 playing pieces represent leaders, infantry and tank platoons and artillery batteries. They include the weapons employed by British infantry and armored brigades and German SS and Wehrmacht panzer and infantry divisions. New British tank types include the Churchill, Cromwell and Firefly tanks, the flame-throwing Crocodile, and the bomb-throwing AVRE. The Germans bring tough SS grenadiers, Panther tanks and more. The game includes 39 scenarios and 5 "super" scenarios (combining two or more of the scenarios into a large-scale operational scenario).